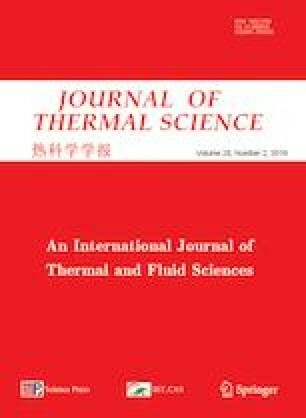 The coupling factor is used in this study to characterise the combined effect of the heat transfer and resistance characteristics of a rifled tube. Boundary layer theory is utilised to investigate the relationship between the comprehensive coefficient and Reynolds number in two regions, namely, higher and lower than pseudo-critical enthalpy. Results indicate that mass flux exerts a decisive negative influence on the coupling effect, and the impacts of pressure and heat flux are weak. The overall effect decreases rapidly as the mass flux increases, but it increases in the area behind the quasi-critical enthalpy. The coupling effect is also affected by specific heat ratio, thermal acceleration and buoyancy. The correlations of heat transfer and friction resistance are deduced with high precision according to experimental data. This work is financially supported by the National Key Research & Development Program of China (No. 2016YFB0600201). Duffey R., Pioro I., Zhou X., Supercritical water-cooled nuclear reactors (SCWRs): current and future concepts. steam-cycle options. In: 16th International Conference on Nuclear Engineering, Orlando, Florida, USA, 2008, Paper No. ICONE16-48869, pp. : 469–477. DOI: https://doi.org/10.1115/ICONE16-48869.